Humax launches 1TB Freesat Free Time box | What Hi-Fi? Humax has released its latest Freesat+ box, the HDR-1000S/1TB, complete with the new Freesat Free Time EPG. The PVR has a 1TB capacity hard disk that allows you to record 600 hours of SD content or 250 hours for HD and joins the HDR-1000S/500GB box, which was the first Free Time box to be released. Freesat+ Free Time is a new EPG, which attempts to bring a YouView style look and feel to Freesat. 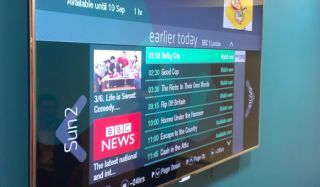 The new interface allows users to move effortlessly between live digital channels and catch-up TV content from BBC iPlayer and ITV Player (4oD and Demand 5 are scheduled for release in late 2012), as well as back and forward in time through the EPG. Set to be available on a new generation of Freesat+ boxes – but not as an update to existing Freesat+ boxes – the new Free Time TV guide will roll out across other boxes from partners Manhattan, Philips and Sagemcom later this year. This box, like the HDR-1000S/500GB, is ethernet-only, though Freesat has told us that more boxes will launch very soon and a WiFi-box is likely. Also promised in the near future is a Freesat Free Time app for smartphones and tablets bringing remote record and remote control functionality to your portable device. Available from Currys, Comet, John Lewis and independent stores from £299, the Humax HDR-1000S/1TB is on sale now. Look out for our review of the new Humax box very soon.